Unibet are one of the largest internet gambling sites in the Netherlands, Belgium and the Nordic countries (Norway, Sweden, Denmark and Finland). Their sports betting app streams live sports for free to any phone. Watch dozens of different sports live on your phone, including Spanish, German and South American soccer, NBA basketball, golf, tennis, hockey and rugby. Real-time football live stats: scores, fouls, shots on target, possession, cards etc. 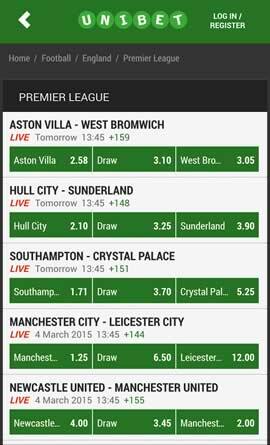 Place single and combination bets from any Windows, iOS or Android device. Full account access from your phone, incl. banking and a complete bet history. Choose between the web-based version or download the Unibet native apps for iPhone, iPad, Windows Phone or Android tablets or smartphones. Unibet have been in the betting industry since 1997, but for one reason or another have never really managed to scale the heights of a bet365 or BetVictor. The company have worked hard to produce a decent sports book though and one of their latest innovations has come in the form of the sports betting app. Throughout this review we will be looking to see if the app will be able to propel Unibet into a major force in the sports betting industry or merely keep their head above some highly competitive waters. It has to be said, when you first open up the Unibet app the first impression is actually quite good. It feels very much like a no frills kind of app, which is a positive in our opinion. You don’t get a lot of graphics and there aren’t a great del of moving parts to it, which are again positives in our eyes. The left hand side will be your navigation menu and this is where you can flick between the different sports and markets. A nice addition is that they include about 6-10 of the most popular betting markets at the time of viewing. Whilst some people will know exactly which markets they are looking for, those of you who are going to see what’s about should find this feature handy. Also, at the top of this section is an ‘Enhanced Multiples’ tab where you can see all of the bets that Unibet are currently offering enhanced odds on, which is a tidy little addition. 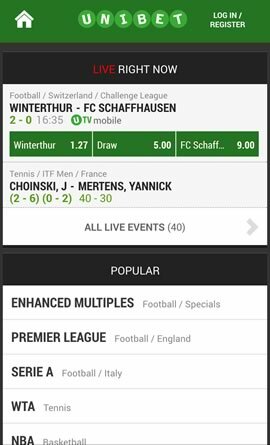 Below that you get a more detailed look at the sports that are on offer and Unibet actually boast 39 sports for your viewing. 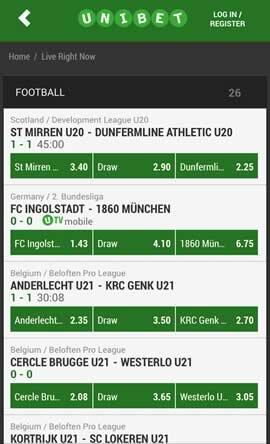 This is a really solid number and we will say that there are very few bookmakers that have this many sports to bet on. The market coverage for each is actually not too bad either. Their main sport comes in the form of football, which at the time of writing has over 25,000 different markets to bet on. A nice little feature at the bottom of the home page is the ‘Most Popular Bets’ tab where the bookmaker provides you with the most popular bets for that day. 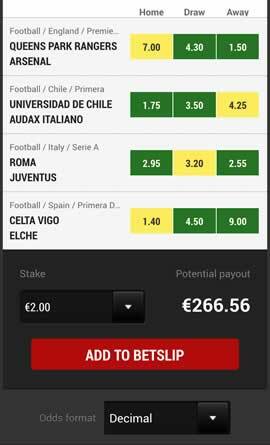 Again these are usually football related, but they form the best four bets into an accumulator and then highlight how much you can win be betting on each outcome. The actual betting markets are laid out quite well, especially when you are betting on live events. A football match will include an overview of the latest score along with information such as yellow/red cards and corners. The betting markets for that game will be below and to the right hand side will be a running commentary of what’s happening in that game. The standout feature for the app has to be the inclusion of live streaming direct from your mobile device. This is definitely one of the main reasons why so many people will access the Unibet app and we are pleased to say that it works very well. The sports and games that you get will vary, but you’ll be pleased to hear that they do include a lot of high profile games and matches from a number of sports. The stream is free to those who have accounts and have placed a wager on that market. At Unibet you will be able to claim a risk free first bet of up to £20. 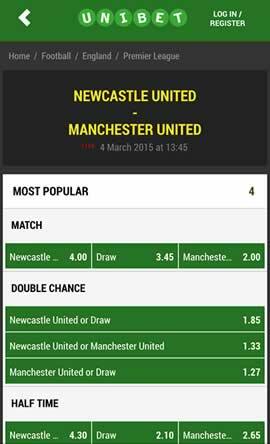 It works by Unibet offering you the stake of your first bet back up to £20 should that bet lose. It’s worth noting that if your bet is successful then you wont be bale to claim a free bet. The bet will be matched 100% up to £20 but you must wager through the free bet amount 6 times before being able to withdraw the funds. So, if you manage to claim the full free bet of £20 then you will need to wager another £120 (£20 x 6) before you can withdraw your free bet. If you make a withdrawal prior to hitting the minimum turnover amount then your free bet will become void. You’ll also need to place qualifying bets at odds of 1.4 or greater and multiple or combination bets will not count towards your clearance rate. 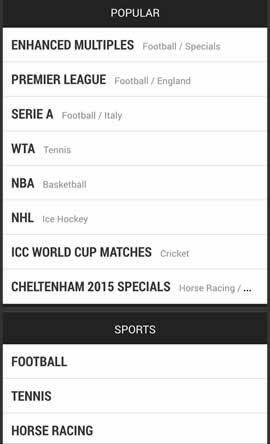 The Unibet sportsbook app is a really solid addition to their sports betting section. Their website is now one of the best looking in the industry in our opinion but to be honest, integrating those sorts of graphics into mobile wouldn’t have been feasible. The app is functional without ever really being exciting. It does what you need it to do well, but it kind of fails when it comes to going above and beyond. We’ve seen some reviews really rip into this app and we feel as though it’s totally unjustified. Functionality is much more important than design in the mobile sector, and even then, it’s far from a bad looking design.